“His eyes, Katsa had never seen such eyes. One was silver, and the other, gold. They glowed in his sun-darkened face, uneven, and strange. She was surprised that they hadn’t shone in the darkness of their first meeting. They didn’t seem human…. In a world where people born with an extreme skill – called a Grace – are feared and exploited, Katsa carries the burden of the skill even shedespises: the Grace of killing. She lives under the command of her uncle Randa, King of the Middluns, and is expected to execute his dirty work, punishing and torturing anyone who displeases him. It’s official, I’m on a streak of bad luck with my novels. 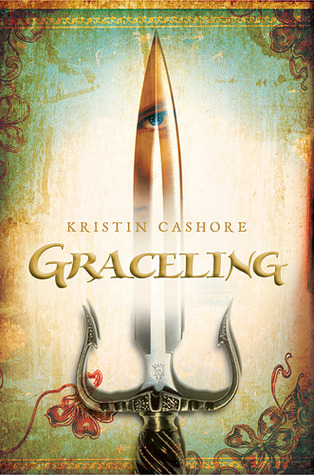 That’s not to say Graceling is bad, it’s just ..less than what I expected, especially after reading all the glowing reviews it received on Goodreads. Katsa is a graceling, a person born with a specific Grace. A skill particular to every graceling, one they are above great at it. Katsa’s grace is killing. She’s both feared and used for her unusual gift, by the people of the kingdom she lives in and by her uncle, Kind Randa. He treats her like his personal attack dog, using her deadly skill against people who wrong him in any way. She first meets Po while on a rescue mission, and against her better judgement, she lets him live when, under normal circumstances, she would have killed him. Eventually, the two become friends, Katsa rebels against Randa’s hold on her, and they leave together on a mission of finding out who kidnapped Po’s grandfather, the man Katsa rescued. Cashore’s writing is great and she’s particularly skilled at world-building. The land of the seven kingdoms is one of fairy tales, magical and beautiful. While I was reading, I could easily imagine I was in RandaCity, in the Middluns, observing my surroundings. The third person narrative is done in great detail, very descriptive, offering some gorgeous imagery. I liked Katsa’s character, for the most part. I can’t understand her disgust toward dresses, jewelery, her long hair and men in general. I’m sorry, chopping off your hair till you’re almost bald does not make you tougher/stronger. Your level of badassery doesn’t decrease if, once in a while, you wear a pretty dress at a party. Her views on marriage and children are confusing, mainly because the reasons she gives make her seem much too young and naive. Also, I always find it frustrating, and hard to believe, when characters like Katsa – strong, independent, smart women – suddenly trust a man they barely know, on the sole reason “they have a feeling”. It’s a cheat! If you characterize your MC like that, then no..she won’t trust a dude just because “she hears something in his voice”, it doesn’t make sense. Furthermore, her attitude and behavior towards people she’s known all her live, confidants, friends, people who care for her, is irksome. She’s rude, she’s much too sour, and it makes her unlikable. I liked Po much, much better. He’s sweet, smart, as strong as she is, and their relationship is an equal one. He tries his best to make her feel comfortable in his presence, he’s always fair to her. I like that their romantic relationship develops normally, at a believable pace. First friends, than lovers. It was perfect. However, I didn’t like Katsa’s reaction when she realized she loved him back. It was over the top and unnecessary. Plus, why does love equate to marriage? And why does marriage equate to loosing one’s freedom? Beats me. The other characters – Skye, Bitterblue, Raffin, Giddon – don’t read like secondary characters, which is a thumbs up for Cashore. They’re as fleshed out and real as they can and should be, especially Bitterblue. Then again, that makes sense since the third novel in the series is about her. I actually found Bitterblue to be far stronger and smarter than Katsa. So young, yet she has a fierce determination that makes her absolutely endearing. If the character flaws were endurable and didn’t diminish my enjoyment, the unnecessary length of the novel was something I couldn’t overlook. The pacing is uneven and it drags at times, which in turn made me skip whole paragraphs because it couldn’t hold my attention. That, coupled with the fact the second installment isn’t even about the same characters, makes it a sure deal I won’t continue with this series. It was just okay.